The Journal of Psychopharmacology is a fully peer-reviewed, international journal that publishes original research and review articles on pre-clinical and clinical aspects of psychopharmacology. The journal provides an essential forum for researchers and practicing clinicians on the effects of drugs on animal and human behaviour, and the mechanisms underlying these effects. The Journal of Psychopharmacology is published monthly (12 times a year) by SAGE Publications (London). 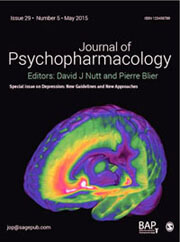 A subscription to Journal of Psychopharmacology is included in the membership benefits of BAP.